Every Holiday is a good reason for casinos to run some special promotions. When it comes to online casinos, it’s basically became a must. At least for the big events. With picked for you the best three Halloween casino bonuses. By the way, all the sites listed here occupie the top spots on our trusted online casino list. 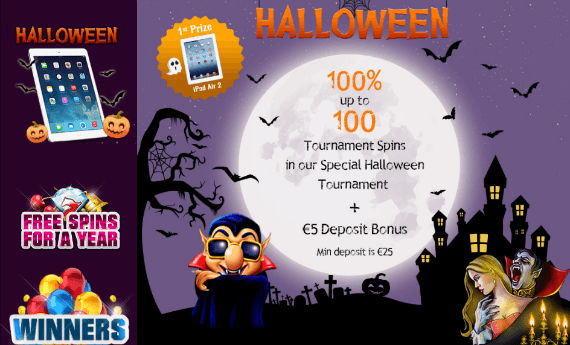 Slots Magic hosts spookily exciting Halloween Tournament which awards up to 100 Free Spins and a €5 fixed bonus. It starts on 31 October and ends 2 November, giving you a chance to take your share of the prize pool consisting of an iPad Air 2 and 800 Free Spins. All you need to do is make a deposit of €25 or more using the Halloween Daily Pick or Halloween Tournament buy-in button and, for each €1 deposited, Slots Magic will give you 1 Tournament Spin. Enjoy your freebies while playing Ninja Master and compete for one of the attractive Halloween Tournament prizes. Royal Panda casino gives away their Halloween treats in the form of 25 Free Spins plus 25 Royal Spins in two fantastic Dracula-themed slots. All you’ll need to do to collect your Free Spins on Blood Suckers is play for €100 on Dracula slot on 31 October. Bravely facing the infamous Count, you’ll get to slay vampires while collecting instant cash prizes! If on the same day you invest €1,000 on Blood Suckers, you’ll get 25 Royal Spins worth €2 each which you can use to play Dracula slot. This is not an either – or affair, you can claim both Halloween offers using your desktop computer or your mobile device. Hurry up, the clock is ticking! 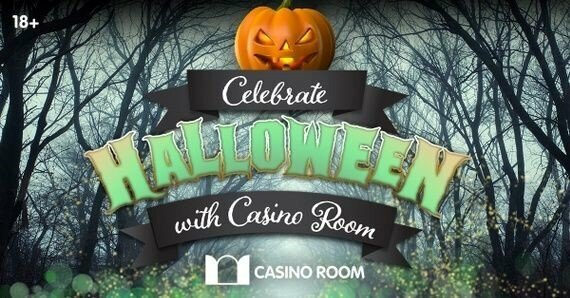 Casino Room celebrates Halloween with the 4 days of horror, each delivering one sumptuous promotional offer to be claimed. On 31 October, you’ll get to collect a 100% bonus up to £100. Use bonus code TRICK1 to benefit from this deadly double-up gift. Provided you manage to survive Halloween, on 1 November you’ll be able to receive 50 Free Spins on Zombies or Blood Suckers. These frightening spins can be yours if you make a deposit using code TREAT2. The very next day, you’ll get to sink your teeth into another tasty treat in the form of a 50% bonus up to £100. You can use code TRICK3 not once but twice, with 2 separate deposits, and get the double dose of this Halloween treat. The fourth and final day provides another beastly bonus. Making a deposit on 3 November while using code TREAT4, you’ll get to claim a 75% bonus up to £300 AND 30 Free Spins on Zombies or Blood Suckers. 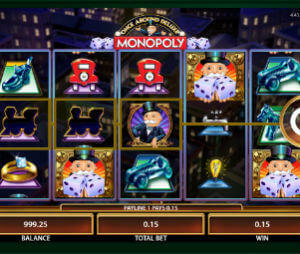 New players, don’t forget that on top you can enjoy Casino Room welcome bonus of 100% match up to £500 + 200 Free Spins!